Pageant girls know that packing for a pageant is no simple task. There are so many things you have to remember! In this episode, I’m going to break down the 7 steps of packing like a professional for your pageant, and I’ll give a few pro tips to make it even easier. Every time we make a decision, we have to use a little piece of energy and willpower. The more decisions we make, the more energy we lose. You may have already heard episode 22: The Girl with the Most Energy Wins when everyone’s beautiful and professional, winning comes down to stamina. During your pageant week, you cannot afford to give up unnecessary energy on choosing which earrings to put with which shoes for which outfit. Or bothering with which outfit you meant for Thursday’s adventure vs. the Friday’s outing after interview. Too many decisions. But this stuff is important, you just need to take care of it before you leave for pageant week. Before any of my clients commits to a pageant, I always recommend that she talk with former titleholders to best understand her experience from her perspective. With multiple perspectives, you get a stronger view of whether or not this pageant would be a good fit for you. I did this the first time I competed in a state pageant and I learned a TON – nothing that scared me away from the pageant, but every piece of insight and advice set me up for success in my competition. Of course, any time you are asking for anything, even advice, from a former titleholder, you have to approach it with grace and respect. 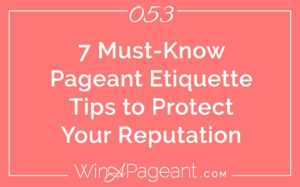 In this episode, I’ll give you a list of what to do and what not to do when approaching a former titleholder of your pageant. I’d like to give a special thank you to those of you who have completed the Pageant Interview Questionnaire – it is fascinating to read what you are really needing and I love the ideas you have! Even the responses that are just echoing what we already know everyone needs like mock interviews and samples of good and bad interviews – this stuff is helping me so much! I’m going to leave the survey up through the end of this week and I’d love to get your feedback! If you haven’t yet, would you mind taking just 5 minutes to fill out the questionnaire. It asks 10 questions about pageant interview and I’m using the feedback to create more trainings for you. When you fill out the questionnaire, you’ll get the mini-series How to Answer the Hardest Pageant Interview Questions, as a “Thank You!” for your time and to support your pageant interview prep! If you’ve done it – thank you, I appreciate you! Before we dive into today’s episode, I want to ask for your feedback. Each week I create these trainings because I really want to impact your pageant experience. We know that the Pageant Interview is one of the most challenging parts of Pageantry and you have to be totally prepared to really rock it. So…I have a few things to help you with that. The first is a product that hasn’t come out yet – I’m still putting it all together and would LOVE to get your insights about what would really help you in pageant interview. There’s a quick questionnaire which you can fill out to give some insights about what you really need to help you with interview. 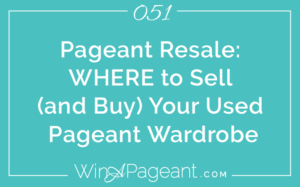 Last week, we discussed HOW to resell your used pageant wardrobe. In today’s episode, I’ll give you a break-down WHERE to sell your wardrobe and give you insight to all the best websites to make it easy on you. In general, sites that provide an opportunity for reselling make money from the seller because they are providing you the forum to sell and the marketing. It’s either on the front end by changing a flat listing rate, or on the back end by charging either a flat rate, or more commonly a percentage of the money you make. If you’re selling a $100 cocktail dress, 6% is $6. If you’re selling a $1,000 gown, it’s $60. If the flat rate is $6/month, and you’re selling a 1,000 gown, that could be a better deal for you as the seller. So, do your math. If you have a low risk tolerance or you don’t know if it will sell, the safe route is to only pay when you get paid, however this doesn’t mean that these sites bring the most amount of eyes onto your wardrobe. For that, consider the size of the audience. If there are tons of people on this Facebook group and lots of activities and you see “Sold” next to many of the dresses, that could be a good sign that it’s working. Another important aspect is a seller and/or buyer guarantee or insurance. E-bay has this. If there’s a problem with the product not being delivered on time or as per the post, or if the seller’s payment bounces or something crazy, there are things in place to protect both parties. It’s a lot better than shipping someone a piece and then waiting an eternity for them to never send you a check. Or, to buy a dress when the buyer tells you they’ll have it to you in a week and it never arrives…see what I mean. This is important. The ease of the transaction is vital. The backend of any web transaction is extremely complex, but they are designed to be secure and smooth. If it’s not, don’t use it. For me, e-bay is super confusing. I’ve sent 2 cell phones out to buyers on eBay before they confirmed the purchase and one didn’t even want it…not e-bay’s fault, but I jumped in too soon and didn’t know what I was doing. So, be sure you are comfortable with the site, the process, and the payments before committing to anything. Finally, your timing is crucial. Don’t post something on a site if you aren’t able to ship it when someone buys it. Like, if you’re going out of town for 2 weeks or you have the flu or it’s tech week for your dance school, it’s gonna be tough to watch your email for questions and purchases. Be ready for someone to buy it – cleaned, packaged, and prepared to ship immediately. At the bottom of this post, I’ve included a list of 10 websites and several Facebook groups for you to consider when buying or selling used wardrobe. There are consignment shops, e-bay types, and even wardrobe rental options. I haven’t used any of these myself so I can’t speak from personal experience on these, but I know that it has worked for lots of my pageant sisters. Just, please do your due diligence to vet these to make sure it’s right for you. It’s definitely a fun experience to see someone in the same gorgeous gown you only wore once. It makes you want to cheer for them extra loud!